Welcome back to Technique Tuesday! Today we’re taking a look at one of the most basic and essential techniques in art: chiaroscuro. Chiaroscuro (pronounced “keyARo-scuro”) is another art term with its roots in the Italian language. As the two parts of the word translate to “light” and “dark,” chiaroscuro is used to describe the technique that artists employ to add light and shadow to an object to make it appear more three-dimensional. For instance, it’s what makes the difference between a drawing of a circle and a drawing of a sphere. Sometimes this is simply referred to as “shading,” but the technique goes a bit further than that, as the detailed depiction of light’s effect on a surface is what gives that depiction a real sense of depth and volume. Now, there’s no reason at all to criticize or disparage ancient Egyptian wall art; indeed, the colors, compositions, and use of lines and form (not to mention the storytelling!) in Egyptian art was certainly an achievement. The shapes, lines, and colors used to portray the figures on the left here are absolutely effective. But the development of chiaroscuro was a huge leap forward for artists in using a flat surface to recreate what we see in the three dimensional world. You can see in Michelangelo’s painting of Cybil here that the meticulous depiction of every little place of light and shadow brings both the figure and the textiles vividly to life. All-star of the Italian Renaissance, Leonardo da Vinci was the first of the Old Masters to really bring chiaroscuro to its full potential. 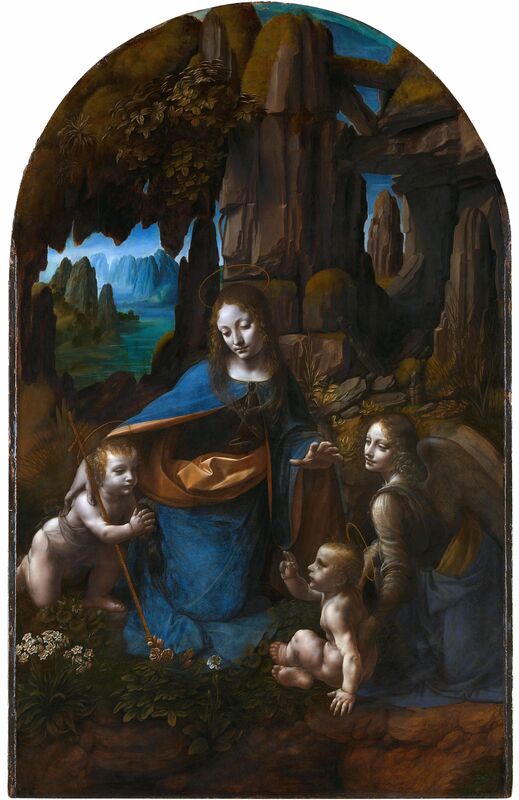 He was particularly skilled at using chiaroscuro to give dimensionality to textiles as well as a sense of roundness to the human form, as one can see in his painting “The Virgin of the Rocks,” shown below. Truth be told, you can see chiaroscuro working its magic on nearly all of the artworks in our gallery. A great many of our talented artists utilize chiaroscuro to give life and depth to their work. There are, however, some excellent examples of how chiaroscuro can provide a profound sense of realism found in the work of still life artist Larry Preston. Check out these paintings below to see how Larry’s careful observation of the effects of light on objects gives the impression that you could almost reach out and touch them! You can see more of Larry’s incredible and realistic still life paintings on our website by clicking here. In fact, keep an eye out for chiaroscuro in all the art you see! You’ll find countless excellent examples at the gallery of chiaroscuro in action. If you’ve got a particular favorite example, be sure to share it in the comments! We’ll take a look in a few weeks at the way that some artists take chiaroscuro to a whole new level when we explore “Tenebrism” on another Technique Tuesday. Be sure to subscribe to our blog (see the box at the top right of the page) to see all our new Technique Tuesday posts as well as other exciting news from Principle Gallery!